Turns out the petting zoo had been closed who knows how many years earlier (possibly by the local Health Department). But then a miracle occurred, proving that good things happen to those who at least take a shot. 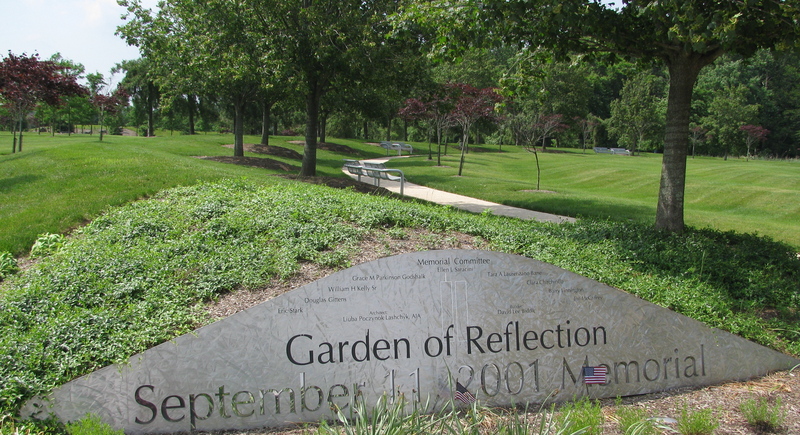 On the way home, not ready to give up, my wife spotted a shiny new sign by the side of the road, “Garden of Reflection – 2 miles.” Garden of Reflection? Hmmm. Still in need of some sort of adventure for the little guy, she followed the signs through three turns along tree-lined back roads and found a grassy park built around a fountain. 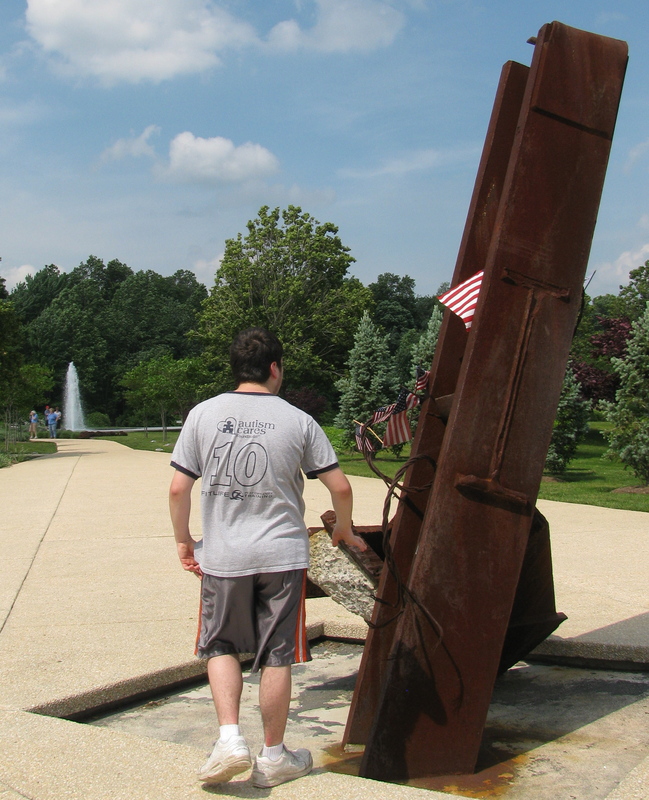 The fountain was dedicated to the 18 people in our area who died in the attacks on September 11, 2001. It fit the bill for a Clay-friendly spot. Not crowded (since few people had discovered it, yet). No fee (so we could stay as long or as short as we needed). Easy access (for quick getaways). 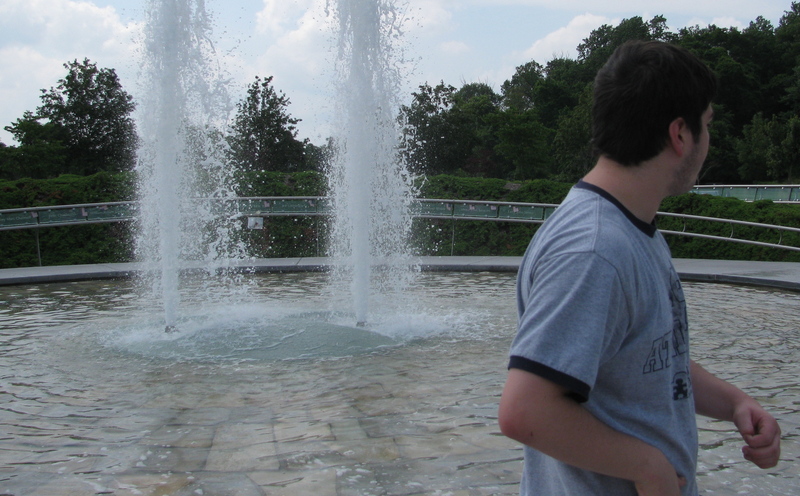 Most importantly, Clay loved the fountain. She had struck gold. A photo of Clay dancing around the fountain appeared on my phone. A new spot was added to our list. So, this Sunday, when Clay needed a trip someplace (and it was just him and me), this new spot topped our choices. He and I jumped in the car with just a vague idea of where we were going. Didn’t matter. We were out of the house and off to the Garden of Reflection. After just two wrong turns, we pulled onto a long driveway, past a row of vegetable gardens and parked in a circular lot. Clay bolted toward the fountain as soon as I opened his door. He circled the spraying water, arms shooting out in excitement. A few other families showed up, so we wandered to quieter terrain. 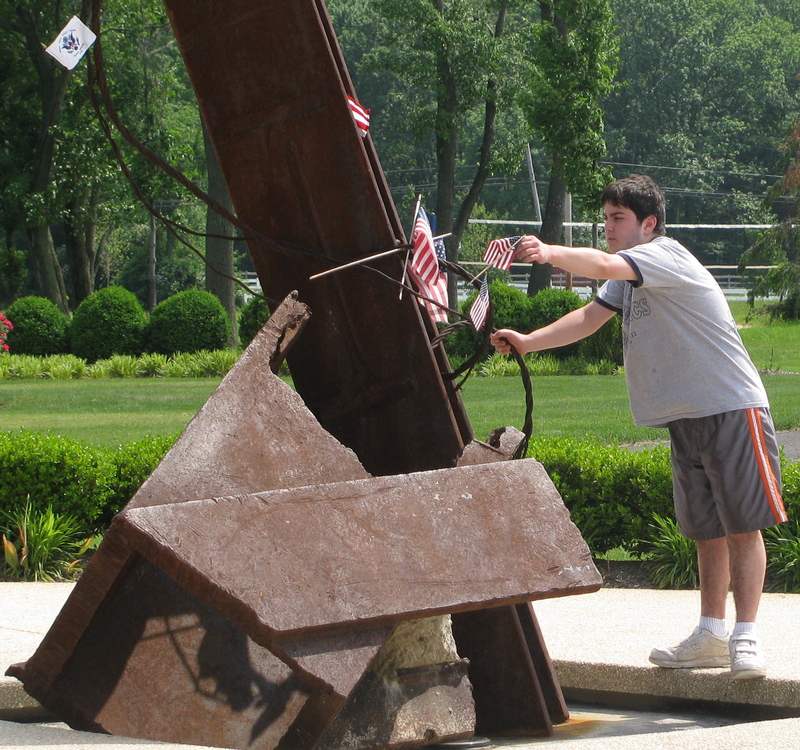 We passed the list of names of the victims, and found ourselves in front of some steel fragments taken from the rubble of the World Trade Center. Clay particularly liked the flags. Fortunately, they were fastened tightly. It was a hot afternoon, and more people were arriving. So, we took one last look. Then it was time to head home. On a high note. What did the little guy think? Here’s the conversation he had with his Mom a couple days later on the keyboard he uses to communicate. Relaxing. A rare commodity for a boy who can’t sit still and the parents who follow in his wake. You know we’ll be back to the Garden of Reflection to get more of that. This entry was posted on June 2, 2011, 8:59 am and is filed under Communicating, Daily Life. You can follow any responses to this entry through RSS 2.0. You can leave a response, or trackback from your own site. Lovely. Just lovely. We are often in search of Ian friendly spots. Sounds like this one would be perfect. Great story. I love the use of the collective “we” as in “We so like the sound of water.” People with autism – who are supposed to be in their own world, by definition – really ARE more connected to others than we think. And I have yet to meet one who didn’t have a special affinity for water. Great to hear from you, Char! Did you see my guest blog in February in which Clay reveals why he refers to himself as ‘we’? Roe – I have that blog of yours hanging on my office wall. It reminds me of my own personal “we”. Wonderful story, and I am so happy that you have found this special place where Clay can relax for a time! 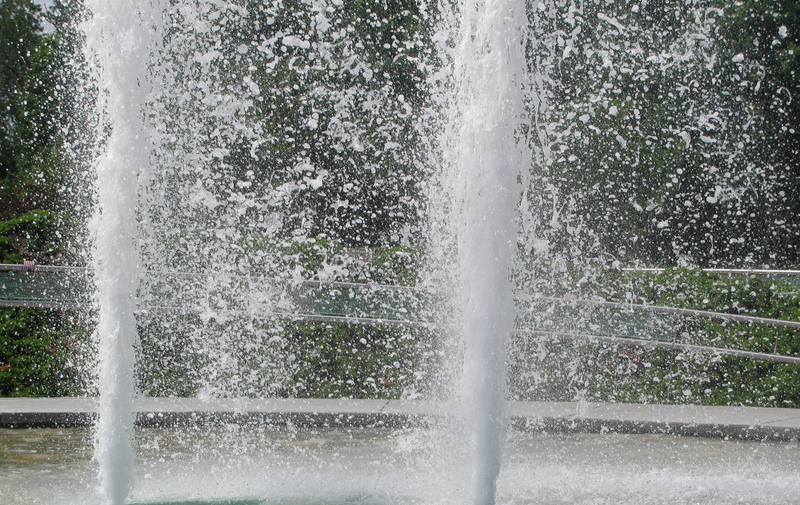 I like the sound of fountains, and splashing water, and especially the ocean. I’ve spent entire days sitting on the rocks by the ocean watching and listening and feeling the waves in my ears. I think I’ve convinced my housemate to add a fountain to the pond he’s digging in the backyard, so I may get my very own fountain this summer. My hummingbird friends will appreciate the fountain too, they like to clean their wings in sprays of water. 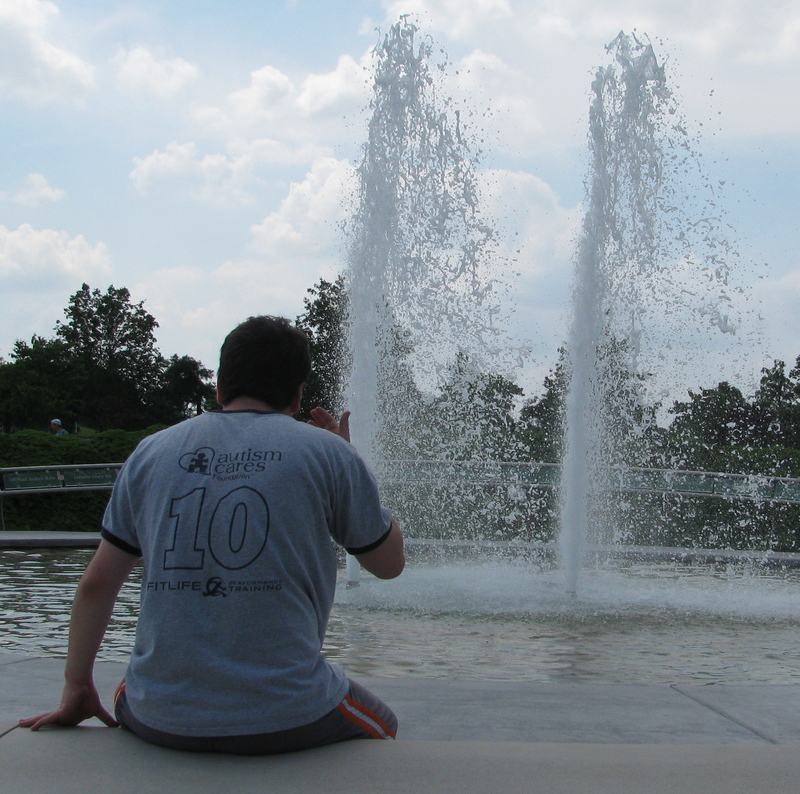 I agree with Clay, so calming, feeling the sound of water fountains in my ears. Thanks for your thoughts, Ari. 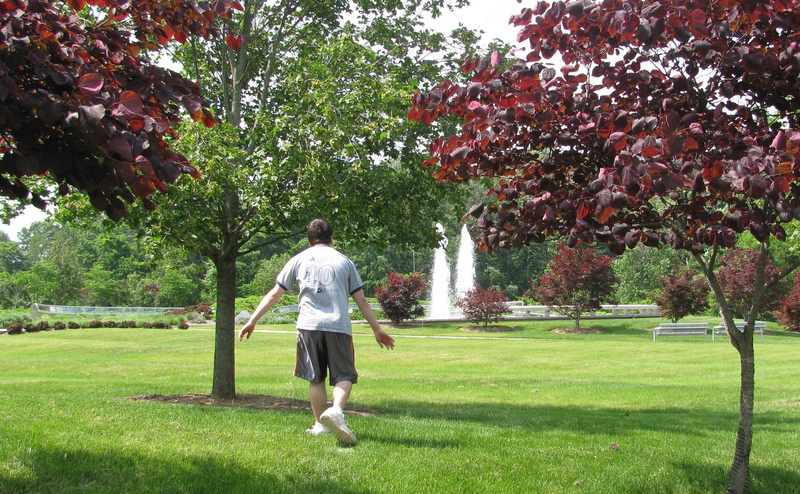 I’ve added your blog to the blogroll so others can enjoy your insights on life with autism. Hope you get the fountain. Finding these places is a little piece of heaven. Glad you’ve located another one for Clay, and for yourself!